Well , it was pretty good at a number of locations on the south end of Hutchinson Island like Santa Lucea, Fletcher and parts of Stuart Beach. Pompano, bluefish, mackerel, whiting, jacks, ladyfish, and even bonefish were all on the catch list. 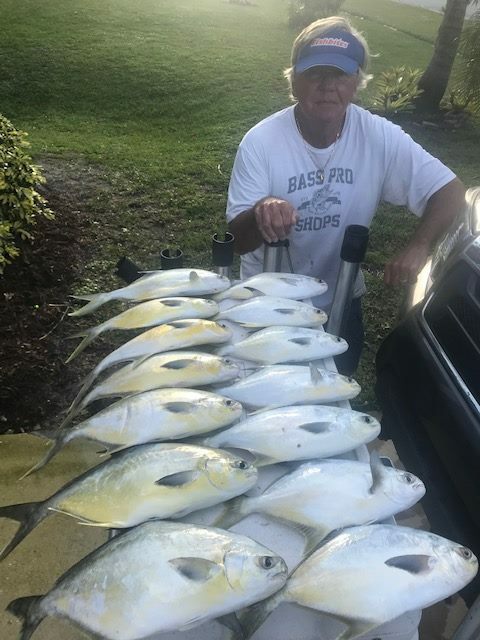 I fished in the Stuart Beach area with my son Randy and his friend Chris Battjer from Palm City and all of the above species were taken. Fishbites, EZ Flea, Orange Clam, and the new chartreuse Crab scent all caught fish along with clam strips and blanched sand fleas. Chris was throwing the spoon that put the mackerel and jacks on the beach. The pompano bite was excellent as we had steady action on that bite from first light until 10 am. I received reports from this area to Hobe Sound and it sounds like the bite was good everywhere. The upcoming week looks good as far as the weather and if today was any indication the chances of putting some fish in your cooler is pretty good. High tides will be in the morning so target your trips to start from 8 to 10 am. Good luck and catch em up.